In the recent US primary elections, the trend has been for establishment republicans to beat Tea Party radicals. Or that was the trend, until the recent defeat of congressman Eric Cantor (R-VA) at the hands of relative unknown Dave Brat. A sitting US majority leader has never before lost a primary election. This puts these two narratives into conflict–is the Tea Party on its last legs, or is it roaring back into prominence? Let’s take a look. If a Tea Party candidate were to run on the GOP ticket for president, his odds would be poor, to say the least. 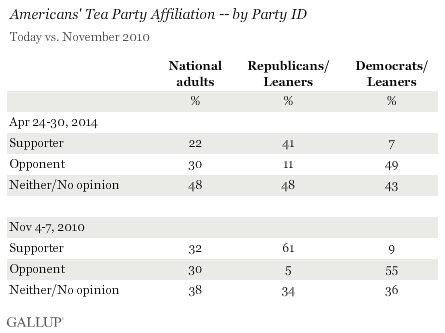 But look at those figures among republicans–even now, republican supporters of the Tea Party outnumber opponents by nearly 4 to 1. That’s a far cry from the 12 to 1 ratio the Tea Party enjoyed in 2010, but it’s still more than enough to sometimes win elections that democrats do not participate in–like GOP primaries. As long as the 1/5th of the 48% of republicans who do not consider themselves supporters or opponents of the Tea Party defect to the Tea Party candidate, a radical can win a republican primary. So why did senators Lindsey Graham (R-SC) and Mitch McConnell (R-KY) fend off their Tea Party challengers while Eric Cantor faltered? All three are major establishment republicans, career politicians that strike Tea Party radicals as repugnant RINOs (Republican In Name Only). The key difference? Graham and McConnell are senators. Cantor is in the house. In a senate primary, republican voters are choosing candidates knowing full well that those candidates are going to have to win a statewide vote against a competitive democratic candidate. While both South Carolina and Kentucky are red states, they have substantial democratic minorities. In the 2012 presidential race, Obama won 44% of the votes in South Carolina and 38% of the votes in Kentucky. Obama posted these figures against Mitt Romney, a relatively mainstream republican politician. In a senate race, a white southern democrat is likely to be far more appealing than Obama while a Tea Party candidate is likely to be far less appealing than Romney. The democratic candidate will also likely receive substantial funding from the state DNC. Cantor was elected to congress in 2000. His democratic opponents have been spectacularly weak–they’ve averaged only 35% against him. The Virginia DNC does not bother to expend significant campaign money on the race in the 7th district because it is solidly red, and the primary voters in that district know that. They can be confident that whoever they pick will easily beat the democratic candidate. This enables them to choose a Tea Party radical without fear of losing an otherwise winnable seat. This is what makes house races fundamentally different from senate races for the Tea Party–a congressional district can be Gerrymandered, but a senator has to win a statewide race. While individual states deviate significantly from the nation as a whole, individual Gerrymandered congressional districts deviate far, far more. This allows extremists to far more easily be elected to the house than to the senate. 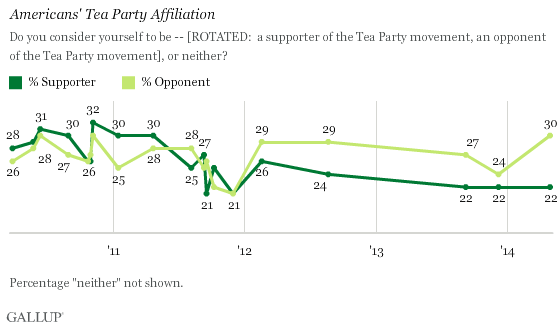 The Tea Party has never been capable of winning a national presidential campaign. It has had some success with statewide races in the past, but its ability to win governor and senator races has sharply declined. However, it remains positively lethal when competing in Gerrymandered district races, either for the US House of Representatives or the various state senates and state houses. As a result, it’s still very possible to see state governments entirely dominated by Tea Party legislators and for these Tea Party candidates to get national attention by jumping to the house. This has made the house remarkably extremist and set it at odds with both the senate and the administration. It also explains why, even as the Tea Party gets less and less popular nationwide, the house continues to be bellicose and out of touch. Tea Partiers in the house know that they do not have to win nationwide elections or even statewide elections. They only need to win their districts, and their districts have been Gerrymandered to the point that primary voters no longer have to balance their ideological preference with electability. Candidates in these districts compete for the label of “most ideologically pure”. The tone of these primaries assumes the truth of hard right principles and reinforces belief in those extreme principles among voters. This polarizes voters still further and creates these bizarre little enclaves of hard right politics that are completely disconnected from the wider national mood. Pundits are looking for mistakes in the Cantor campaign, but it’s not their fault–if McConnell or Graham were in the house, it’s far more likely they would have been tossed too. Cantor lost because he doesn’t represent the whole of a red state, he represents a red district in a red state, and the latter is far more extremist in character than the former. Long after the Tea Party has disappeared from nationwide or statewide relevance, it will linger on in these reactionary enclaves, embarrassing the GOP on a national level and helping the DNC win other elections. By Gerrymandering the districts, the GOP has self-generated this problem and enabled its extreme wing to gain high places in the house on the national stage. In the meantime, we can expect the house to remain far to the right of the rest of the federal government and the American people as a whole, obstructing initiatives and derailing problem solving.